I love to use my slow cooker all year long. When it's snowing it's great, because I can be bundled under a blanket, and dinner will just magically appear. In the summer it's great, because you don't have to heat up the whole house just to make dinner. 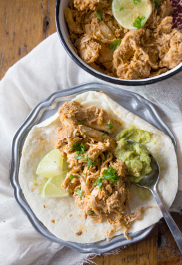 This super-flavorful citrus-cilantro slow cooker pulled chicken is perfect when eaten plain, piled high on nachos, stuffed into a taco or wrap or to top a hearty salad. To a slow cooker, add the salsa, lime juice, cilantro, chili powder, cumin and smoked paprika. Stir to combine. Add the chicken to the slow cooker, and cover it with the salsa mixture. Cook on low for 6 hours, until the chicken is tender.